Get more visibility and get more visitorsMake your site search engine-friendly, explore advertising options, and moreWhy do some sites pop to the top when you search? How do you make yours one of them? You create sites that make search engines happy, and here's how! 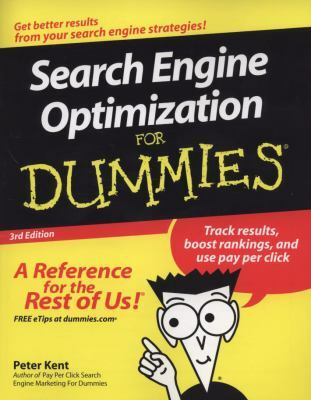 Find out which search engines matter most, what they look for (and what they hate), how to get indexed, and the best ways to spend ad dollars.Discover how to:Choose the right keywordsBuild pages that offer visibilityGet your site into directoriesAvoid things search engines don't likeMeasure your resultsUse social networking sitesKent, Peter is the author of 'Search Engine Optimization for Dummies', published 2008 under ISBN 9780470262702 and ISBN 0470262702.